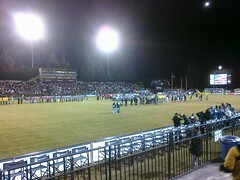 The San Jose Earthquakes are hosting the L.A. Galaxy today at Buck Shaw Stadium on El Camino Real in Santa Clara. With the Galaxy come Landon Donovan and the Earthquakes have been hyping that fact to promote the match. It worked; the game is sold out. I had considered going to the game today but the scheduling didn’t work out. I was going to take my son for the fun of seeing Donovan, the hero of Team U.S.A. soccer, but I have since learned it isn’t that simple. Real Earthquakes fans, I’m learning, hate his guts. Donovan started his MLS career at San Jose and was wildly successful, leading the club to championships in 2001 and 2003. The local fans loved him and were hugely supportive. Then in 2005 he was acquired by archrivals the L.A. Galaxy. Many in San Jose saw it as betrayal and have not forgiven him, though it wasn’t entirely his doing. 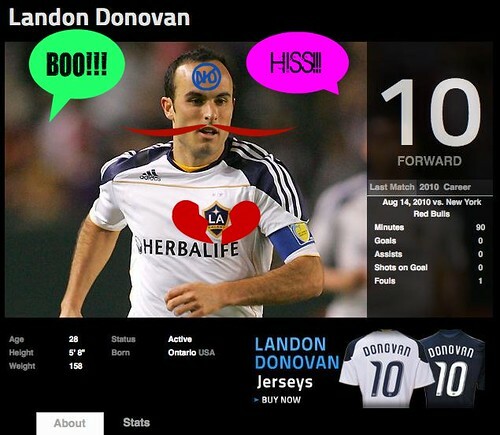 In parallel however Donovan has become nationally popular playing for Team U.S.A. in international football matches. He wore the red, white, and blue in the 2000 Summer Olympics in Sydney and in the 2002, 2006, and most recently 2010 FIFA World Cup finals. He will forever be remembered for his late goal on June 23, 2010 which lifted the U.S.A. over Algeria, earning us the top spot in the group and advancing us to the knockout round. My son and I watched that match that morning and when Donovan scored we lost our freaking minds, jumping around, embracing, hollering with elation. Perhaps it’s good we aren’t going today. I can’t call myself a loyal Earthquakes fan or a huge soccer fan. I’ve only been to one Earthquakes game and I only pay attention to international soccer every four years when the World Cup rolls around. I hate to think what would have happened if I had brought my son to Buck Shaw today and we blithely cheered Donovan as he took the field. At the one game we went to, the final home game last season against the New York Red Bulls, I was surprised and impressed by the vigor and volume of the San Jose fans with their non-stop songs, noisemakers, and loving support. They are fantastic. San Jose isn’t known for hooliganism, but I’d hate to go down in history as the guy who sparked it. San Jose Bike Party is tonight and once again they are taking it to The Street, El Camino Real. To finish out the route the riders will be hopping on El Camino in Santa Clara at Los Padres Blvd and following it all the way down through The Alameda into downtown San Jose, ending at City Hall. The theme Hot August Lights is a play on Reno’s Hot August Nights so there will be bikes tricked out in their finest regalia and sporting plenty of lights (a sly way to promote bike safety). If that’s not El Camino love, I don’t know what is. Indeed the ride starts tonight at San Jose City Hall, located at East Santa Clara Street and South Fourth. The food trucks will be there in force to send them off fully fueled: MoGo BBQ, QuickDog, Kalbi BBQ, and The Louisiana Territory. Treatbot would be there but sadly they’re having vehicle trouble. One commenter on Facebook quipped they should find some bicycles to tow the truck; there will be no shortage of pedal power tonight! In addition there will be something special at the kick-off (roll-off? ): a performance by Japanese drum troupe San Jose Taiko. They are promoting their Rhythm Spirit 2010 Concert, coming September 10-11 to the Campbell Heritage Theatre. Ei ja nai ka! Bike Party. For those about to roll, we salute you! My friend Philein Wang is looking for dancers. In 2007 she founded ZiRu Productions, a multi-cultural multi-disciplinary performance company which showcases dance, original compositions, and spoken word. Her dance style encompasses ballet, modern, hip-hop, and uniquely, martial arts. This season includes performances in the Bay Area and in Beijing. That’s in China. The audition announcement is below. She has had the good taste to hold them at a venue on El Camino Real, Napa Dance Club in Redwood City. Philein is an insanely talented woman. She dances, choreographs, writes, and sings. She’s probably really good at staring contests too but no one has been able to hold her still long enough to find out. We attended one of her performances in 2008 in San Francisco and it was marvelous. If you’re a dancer or you know dancers (spread the word! ), this is a terrific opportunity to be part of something special. If you’re not a dancer, she’s looking for sponsors too; click here for information on how to donate. Philein/ZiRu Productions is looking for 2 female and 2 male dancers for their Fall 2010 Season. ► ► For more information on ZiRu Productions, please visit www.ziruproductions.com or email info@ziruproductions.com if you have any questions. My wife was lucky enough to win tickets to the San Jose Jazz Festival this past weekend and I’m smart enough to be married to her in a community property state, so on Saturday the family headed downtown to enjoy some sunshine and great music. I could go on and on about our new favorite thing, chimney bread, or the delicious Creole food we ate, or my spectacular mudd pie brownie sundae, or Paulette’s authentic East Coast Italian ice. You’d have to physically shut me up if I started to describe Maceo Parker‘s funkdified set, or Marcus Miller‘s transcendent recreation of Miles Davis classics. But I’m not here to tell you about that. I’m here to tell you about the Sunnyvale Art Gallery. While we were at the Jazz Festival, the Sunnyvale Art Gallery was holding the “Trash to Treasure” event I plugged on Friday. I really wanted to check it out so we left San Jose and hightailed it up to their location on El Camino in Sunnyvale, across the street from the Cherry Orchard. We caught the very end of it. Sadly we missed the live music, but it’s not like we were starving for tunes that day. Three painters were still hard at work on their masterpieces so I had a chance to chat with them. Oscar’s a computer scientist who’s currently studying art. 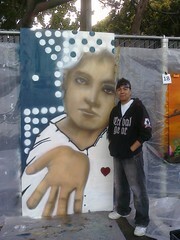 His piece depicts a child begging on the streets of his native Mexico City. I told him, a little embarrassed, that my first impression was of a soccer player because the stark white shirt reminded me of a jersey. It’s done completely in spray paint and he was adding the final circle elements with a stencil as we showed up. I was amazed at the subtle skin tones he achieved. 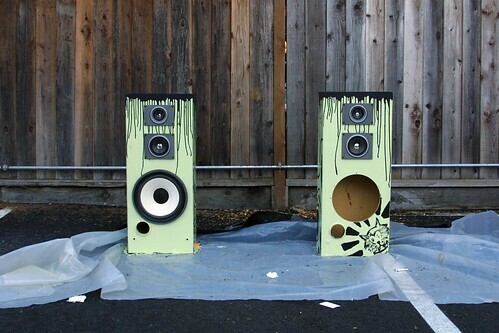 I have no idea how he did that with spray paint, though I can tell you he had an awful lot of cans with him. I’m guessing they were labeled something like “flesh #1,” “flesh #2,” “flesh #3,” etc. Graphic designer Angela was halfway through her painting, a tribute to imagination in which a young woman puts pen to paper and creates limitless visions with tiny capoeira dancers giving body to her flights of fancy. Angela and her subject were inspired by the Shel Silverstein poem “Listen to the Mustn’ts.” Anything can happen, child. Anything can be. Heather created a dramatic landscape in two halves, one side showing a flaming sky behind living flora, the other showing charred trunk skeletons on a cool evening. I loved the sense of opposites in balance, a multi-dimensional yin and yang. Her day job is producing artwork and lettering signs for Trader Joe’s grocery stores, but it was clear she enjoyed letting loose here. All the artists I talked to enjoyed their day making art in each other’s company though it was grueling. Oscar worked on his painting for about seven hours and was exhilarated but exhausted. Tim the owner of the gallery told me the event was a success. Five bands performed throughout the day, and other painters were there earlier to decorate some erstwhile “trash.” Everyone looks forward to coming out and doing this again. I’d be remiss if I didn’t mention the gallery’s cafe. We all ordered sandwiches, though I neglected mine for a bit while I was chatting with the artists. Tammy, Tim’s sister, whipped up some fantastic paninis: pastrami for me, bulgogi and a salad for Paulette, and grilled cheese for our son. I had eaten there earlier in the week and had the barbecued roast beef, also delicious. Their sandwiches are all named for artists: Da Vinci, Michelangelo, Van Gogh, Dali. I’ll leave it to you to guess which is which. It was yet another winning event on El Camino Real. I have to smile at the creative spirit which continues to thrive on this Grand Boulevard. I hope they have another Living Art session soon. When they do I’ll be there because I want to check out the live music. With apologies to Vincent, I’ll be all ears. Back in June my wife and I flew down to Los Angeles to attend the Mixed Roots Film & Literary Festival. This is the annual event put on by the dynamic duo Heidi Durrow and Fanshen Cox, whom I wrote about back in April. The festival took place at the Japanese American National Museum in Little Tokyo, downtown Los Angeles. Little Tokyo is just one Metro light rail stop away from Olvera Street which commemorates the original site of El Pueblo de Nuestra Señora la Reina de Los Ángeles de Porciúncula. Olvera Street isn’t literally the spot where Los Angeles was founded as a dusty little village in 1781 but it’s not far. It does contain the oldest remaining house in the city, the Avila Adobe. The city maintains Olvera Street as its historic district so it is bedecked with historical markers and the look and feel of old Mexico. It’s bustling with tourists, but across the street is a quiet little patch of grass, Father Serra Park. 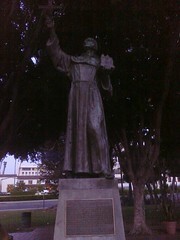 It is a tribute to Junipero Serra of course and has a statue of El Padre Presidente holding a cross and a tiny mission. 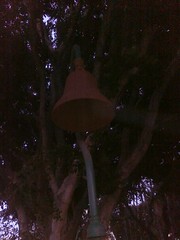 A few yards away is an El Camino Real bell. I had a vague recollection that there might be something special about this bell, and when we got home, I confirmed it. This is the first El Camino Real bell. Sadly that’s a bit of an exaggeration. The first bell was placed by Mrs. A. S. C. Forbes on the other side of Olvera Street in front of the Plaza Church on August 15, 1906. 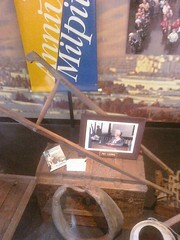 That original bell hasn’t survived but a new bell was dedicated in the same location in 1998. To celebrate the centennial of that first bell, the Father Serra Park bell was erected on August 15, 2006. Read the L.A. Times’ story about the centennial celebration here on the web site of the California Bell Company which continues to forge the bells over a century later. I regret that we didn’t get over to the church to see the original bell site, but this centennial bell is very special in its own right. It’s basically a picture of the sun through a gap in the trees. 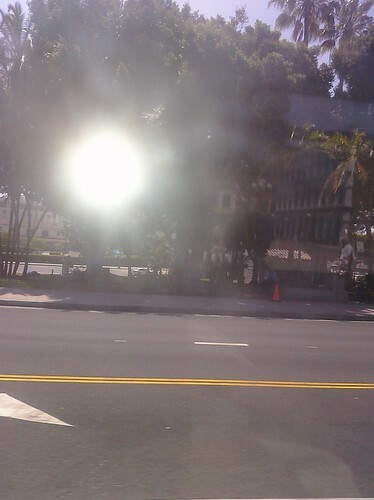 Somehow the sun, the Earth, me, my camera, Junipero Serra, and the centennial bell all lined up perfectly in the split second my finger released the shutter aboard a moving bus. It’s not much of a photo but it was a thrilling moment. Illumination can come when you least expect it. El Palo Alto, the giant redwood that gave the city its name, has been tagged by graffiti vandals. I am disgusted. This is so wrong on so many levels I hardly know where to begin. 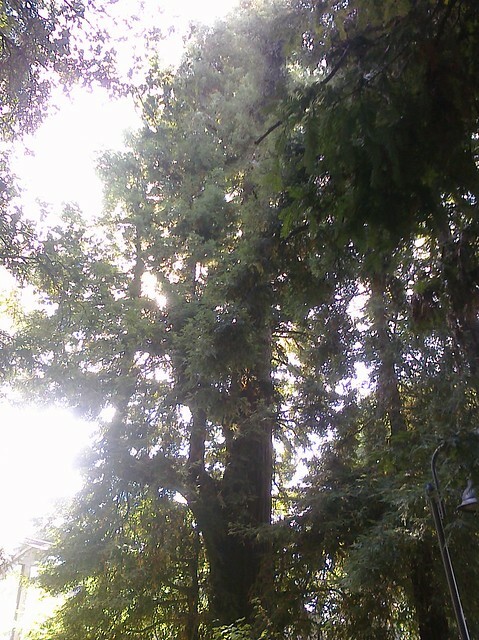 This towering redwood stands over the bank of San Francisquito Creek in Palo Alto near the county line. It’s over 1,000 years old. According to lore it’s where Don Gaspar de Portolá and his expedition camped in 1769 after having discovered San Francisco Bay. It was said to be the tallest tree for miles around so it’s always been a landmark, a defining feature of the region. It dominates the seal of Stanford University and leads the band out onto the field at football games. (If that makes no sense to you, just Google it.) El Camino Real lays beside this majestic tree, humanity’s parade paying tribute as it marches by. I suppose I shouldn’t judge, but it’s deeply disappointing that someone could deface a historic landmark like that. The police are investigating but I suppose the perpetrator may never be caught. At least we have philosophy. The tree has withstood a lot in the last millennium. It used to have a double trunk; one was lost in a violent storm. Pollution from the nearby Southern Pacific railroad nearly poisoned it, but still it stands. The senseless graffiti will fade as will the vandal who put it there, but what El Palo Alto teaches us is that goodwill always endures. The Sunnyvale Art Gallery is putting on a unique interactive art event tomorrow. This is a great place that has an inspiring vision of fostering a community of South Bay artists. Their gallery showcases local artists but they also provide studio space for work and for classes, an art supply store, and a cafe for mortal sustenance. Beyond the canvas they host open mic nights every Thursday for musicians and poets. Valley creatives…this is a place for you. 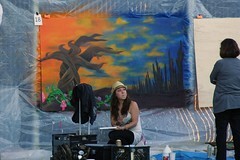 Join us Saturday August 14th, for a grassroots art event that will be like none before in the city of Sunnyvale. Our goal for this event is to bring the young art community together with art, music, and spoken word. Help us create something Amazing. We invite you to join us for this special event. The theme is LIVING ART: Trash to Treasure’. This event will highlight green painting’ as we turn discarded trash to beautif ul pieces of art. 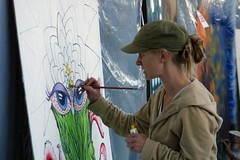 The event will last from 10am-8pm in the back parking lot of the sunnyvale art gallery. This is a FREE event, so let’s blow up the spot. For artists, we will provide wooden panels as big as 8 x 4 feet to paint STREET ART MURALS’. Panels will be limited so register early to hold a spot. For all other artists, we will provide discarded furniture, boards, and other elegant trash’ items for artists to paint on. 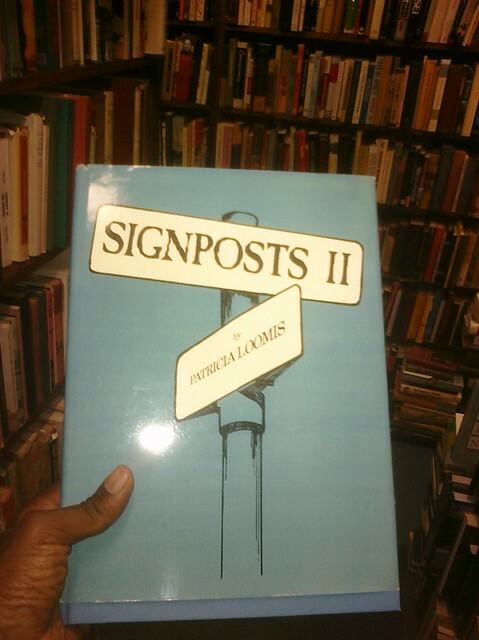 Bring your own if you have anything you’re inspired by. At the end of the day, there will be a silent auction where each artist can auction off their piece starting with bids at $10 if they want. The gallery will take a 10% commission for all pieces to help cover costs for the day. Please bring your own medium if you have (i.e. : paint, etc.) Otherwise, we’ll have extra household paint and brushes for sale at the gallery. For musicians and poets, please sign up in advanced to secure a time slot during the day. A PA system will be provided. An open mic time slot will be available for all late registrants. Performers are allowed to promote their music with CD’s and merchandise. Everyone else, come and enjoy. To sign up or help volunteer, please send your info and/or comments to tim@sunnyvaleartgallery.com to reserve a time slot for music or an area to paint. My wife went out of town for an overnight business trip. When that happens, my son and I usually find a way to get into a little he-man mischief. 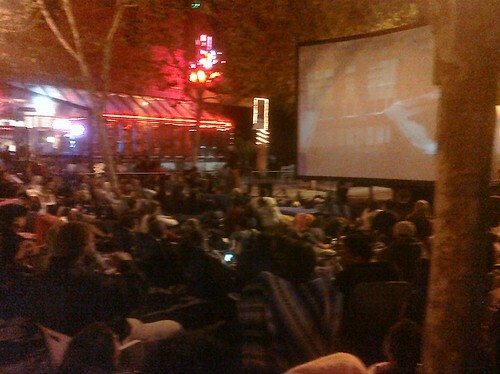 Last night we threw a couple camp chars and blankets in the car, grabbed a nutritious meal from Jack-in-the-Box, and headed to San Pedro Square to watch “The Goonies” outdoors in a big Downtown San Jose block party. Don’t tell my wife that we stayed up way past our bedtimes. Believe it or not my son and I had never seen “The Goonies.” You: “You’ve never seen ‘The Goonies?!? '” Me: “Yeah, I know, right?” What’s more I didn’t know anything about it. I heard of it and I knew it was about kids and I remember confusing it with “Gremlins” when it came out, but that was it. I didn’t know the plot or who was in it. I acknowledge this is pretty strange because I was a kid when it came out, the same age as some of the actors in the movie. I saw many of its similar contemporaries like “Indiana Jones and the Temple of Doom” and “The Lost Boys” but somehow “The Goonies” never made it on my to-do queue. One thing I did know is that people my age love this movie. Our friends at GeekDad.com wrote a moving tribute to its timeless appeal on the occasion of its 25th anniversary this year on June 7. The town of Astoria, Oregon, where it was filmed, hosted a special celebration with a red carpet screening, a bus tour of film locations, a meet & greet with the cast, and a picnic. San Jose didn’t go quite that far but last night was a lot of fun. We got to San Pedro Square about 8:00 PM, parking in the $3 flat-rate city garage there. 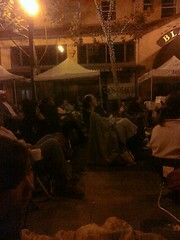 The crowd was already sizable but we managed to find a couple spots on the curb for our chairs. A little to the left we would have been behind a lamp post and a little to the right we would have been a safety hazard obstructing the sidewalk, so we did alright though our view was partially blocked by an especially high-backed folding chair in front of us. It was a little hard to hear the sound system but it got better once the movie started and the audience quieted down. There were a couple tables on the opposite curb promoting the Downtown Association, Broadway San Jose, and selling movie snacks and drinks. My son opted for Milk Duds. I prefer Red Vines myself, but I respect his choices. There was some pre-show entertainment. Fans participated in a treasure hunt where they had to collect clues at various local restaurants. If they found a key they got a chance to try opening a treasure chest live in front of the crowd. The winner found Broadway San Jose tickets inside; the losers won various raffle prizes. Then the organizers held a trivia contest with additional goodies, but my son and I tried to ignore the questions in case there were spoilers. They showed four shorts produced by local filmmakers participating in the Cinequest/Adobe Youth Voices program, then around 9:00 PM the feature presentation began. It was a good adventure flick. I didn’t love it; it was a bit too contrived and there was way too much screaming for my grownup sensibilities (“WAAAUUUGGGHHH…!!!”). The characters were crazy fun though, and the kid actors delivered some great performances. I had no idea Sean Astin and Josh Brolin were in this movie and I didn’t even recognize them. My son’s favorite character was Sloth and football fan that he is, was delighted to learn John Matuszak played for the Raiders. I did get goosebumps as the Goonies unlocked the secrets of One-Eyed Willie’s treasure map and its Spanish legend. Corny as it sounds it reminded me of my own map quests, poring over high-res scans of sepia parchments trying to decipher centuries-old Spanish. And I understood what drove Mikey on. It wasn’t gold, it was the feeling that there was something out there to discover that would unlock something inside. He found his, and the deeper I dig into El Camino Real, the closer I get to mine. You are currently browsing the All Camino blog archives for August, 2010.